Hope you guys are ready to keep the fall flavors flowing, because it's squash season. I love the stuff in nearly every form. Be still my butternut beating heart. Pitter patter for pumpkin. Adoration for acorn. All squash alliteration aside, squash for best known for it's robust flavors and filling bulk. Acorns are particularly well-suited for weeknights because the cook relatively quickly and the stuffing options are damn near endless. This version is full of wholesome quinoa, sweet onions and tart dried cranberries. I also like that each person gets their own squash serving dish. Makes me feel fancy. These guys will be in season for months, so what will you be stuffing yours with this fall and winter? I'm thinking I need to put together a wild rice and sausage version later this winter. Preheat oven to 400 degrees. 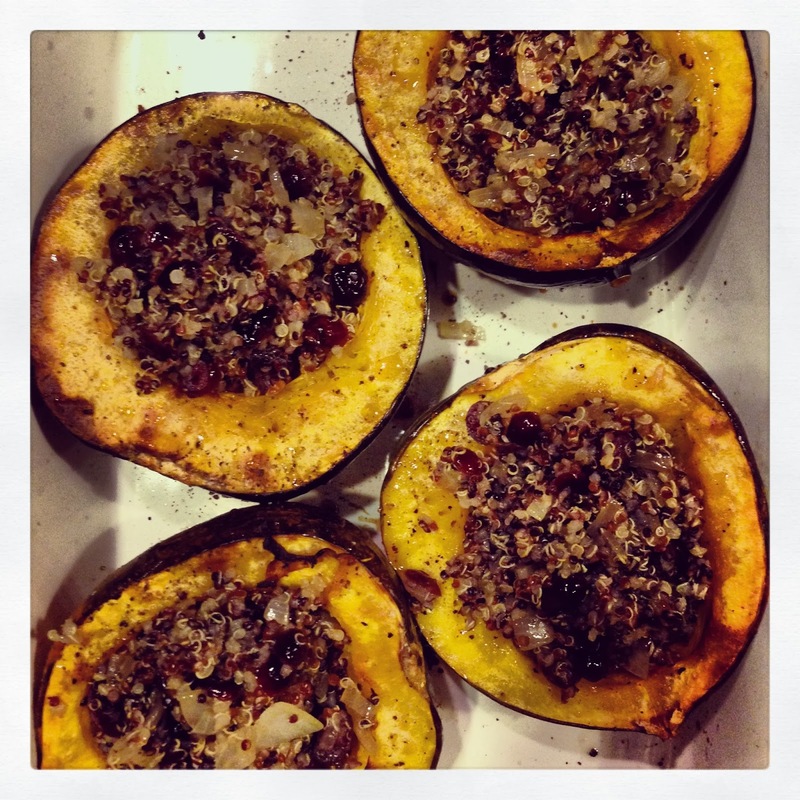 Place acorn squash in a baking dish, skin side down. Brush squash with 1 tablespoon olive oil and sprinkle with salt and pepper. Bake for 30 minutes, until just fork tender. While squash bakes, bring water to a boil. Add quinoa, reduce to a simmer and cover. Cook until quinoa absorbs the liquid, about 15 minutes. In a large skillet, heat remaining olive oil over medium-high heat. Add onions and saute until translucent. Add stock and cranberries, simmering until liquid reduces by half; about 5 minutes. Add cooked quinoa, stirring to combine with liquid. In the last 5 minutes of baking the squash, brush with maple syrup. Once it looks sticky and thick, remove from oven and spoon in quinoa mixture. Enjoy!